With the transition to a socialist system, capital consumption becomes pronounced. Socialism consumes capital (read: eats seed corn). It fails to accumulate productive capital. And, this is why socialist systems retrogress into states of poverty. After all, capital consumption means that too much is consumed in the present at the expense of the future. War, of course, drains the economic bathtub, as capital is destroyed (read: consumed). A transition to socialism also results in capital consumption—a lower level of water in the capital stock bathtub. In Venezuela, the most important part of the economy is the state-owned enterprise PDVSA, the oil giant. Since Chavismo was ushered in, capital consumption has been the order of the day. Physical capital has been consumed at a rapid rate. In short, capital expenditures have been much lower than depreciation, plus amortization (properly measured). PDVSA hasn’t even been investing enough to maintain its capital stock, let alone add to it. Accordingly, the level of water in PDVSA’s bathtub has been falling. If that wasn’t enough, the quality of PDVSA’s remaining capital stock has also been reduced due to poor maintenance practices. On top of the reduced PDVSA capital stock and its deteriorating quality, PDVSA has witnessed a dramatic drop in the stock and quality of its human capital. After the 2002 coup attempt on President Chavez, he purged thousands of “non-loyalists” from PDVSA and replaced them with political hacks. The purges have continued under President Maduro. In consequence, the stock of quality PDVSA management and workers has been depleted. 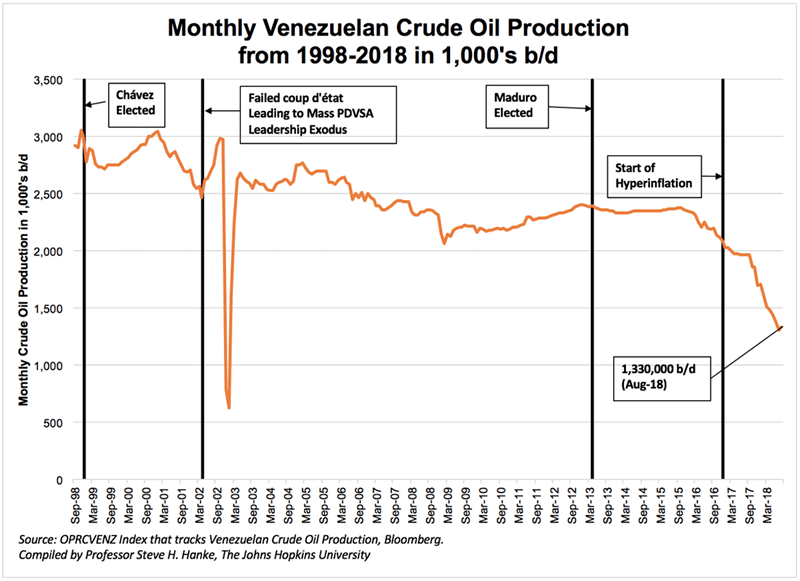 Not surprisingly, PDVSA’s production has fallen (see the chart below). Capital consumption has reduced its ability to produce. At present, production is at levels not seen since 1947. Even though it has the world’s largest reserves, Venezuela is producing less oil than the U.S. state of North Dakota, and the rate at which PDVSA is depleting its vast reserves is so slow as to render them worthless. In contrast to the major oil companies that extract a “median barrel” of oil from their reserves in 8-10 years, PDVSA takes 200 years to extract a median barrel. The collapse in PDVSA’s production is a stunning indictment of the world’s worst oil company and of Venezuela’s socialist system. The bathtub is nearly empty.